Aquinnah, at the westernmost tip of Martha’s Vineyard, is best known to visitors as home of the colorful Gay Head Cliffs and, atop them, the historic Gay Head Lighthouse. The town encloses less than six square miles and has some 400 year-round residents; it is home to commonwealth’s only federally recognized Native American tribe, the Wampanoag Tribe of Gay Head (Aquinnah). According to Wampanoag legend, the ancestral giant Moshup created the colorful clay deposits in the Cliffs by smashing whales against them. 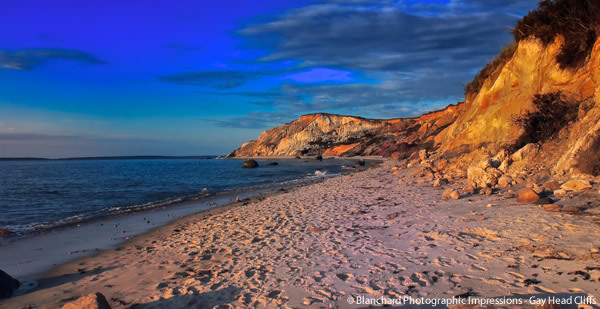 Next to Aquinnah is the town of Chilmark, known the world around for its rolling hills and stone walls, nature preserves and dramatic coastlines. From the South Road you can look across pastures of grazing sheep to sandy southern beaches and the island of Noman’s Land, now a federal bird sanctuary closed to human visitors; the rockier north shore offers views of the Elizabeth Islands chain. Chilmark includes the picture-postcard fishing village of Menemsha, with its quaint shops, tasty seafood and the best views of the sunset anywhere on the Vineyard. North of Edgartown are the two main ferry ports of Martha’s Vineyard, Oak Bluffs and Tisbury. 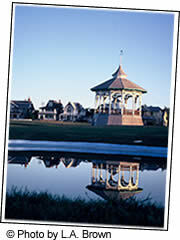 Oak Bluffs, to the east, was once a district of Edgartown, but seceded and became a separate town in 1880. In its early years, Oak Bluffs blossomed as a center for summer religious retreats; one of its architectural treasures today is the Methodist Campground, an enclave of multicolored gingerbread cottages with the grand open-air Tabernacle (built in 1879) in its central park. Both Edgartown and Oak Bluffs have miles of public beaches. And because they are the island’s only “wet” towns – the only ones with hard liquor for sale – both have lively nightlife scenes downtown. Tisbury is the only Island town with two common names – it’s also known almost interchangeably as Vineyard Haven. Tisbury is the official town name, but even the library and post office use Vineyard Haven. Don’t ask us why; we don’t know. Years ago, Tisbury was known by yet another historic name, Holmes Hole, the “hole” referring to the town’s excellent natural harbor. Indeed, during the days of coastal shipping before the creation of the Cape Cod Canal, Holmes Hole was one of the busiest shipping ports on the whole East Coast. Today, Vineyard Haven is still the island’s main port of entry. (Oak Bluffs has a ferry terminal, too, but it closes every fall and winter.) In addition to its scenic harbor, Vineyard Haven has a lively Main Street shopping district. Heading southwest from Vineyard Haven will take you to West Tisbury, another town that testifies to the stubbornly independent spirits of old New Englanders. As the name might suggest, West Tisbury used to be part of Tisbury, but it followed the lead of Oak Bluffs and split away from its parent town in 1892. A visit to West Tisbury will quickly suggest why its residents felt estranged from the built-up village of Vineyard Haven a century ago. West Tisbury has retained much of its rural charm, and its smaller downtown center features the historic Alley’s General Store (motto: Dealers in Almost Everything). Across from Alley’s is another favorite spot, the Field Gallery, with its whimsical dancing lawn sculptures. West Tisbury is home to the Island’s historic Grange Hall, and to the grounds of the Martha’s Vineyard Agricultural Society, home to the popular fair held every August. Six towns, six histories and a hundred square miles of farms and forests, villages and beaches: You might be able to get a fleeting taste of these in a day, but you can spend years exploring Martha’s Vineyard and still have many exciting discoveries ahead of you.